There’s something pretty special about college towns, no matter where in the nation you find them. The combination of young energy and advanced education makes for a unique mix, and most college towns also have an excellent cultural scene that includes music, art, film festivals and more. Of course I’m going to start off with my own school, because I still bleed Carolina blue. While this university is big on sports (go Heels! ), it has a lot more to offer, including the Ackland Art Museum, North Carolina Botanical Gardens, Morehead Planetarium and Science Center, Kidzu Children’s Museum, and the Carolina Basketball Museum. The campus itself is extremely walkable and filled with outdoor art, and if you need a rest, you can relax in the five-acre Coker Arboretum before heading down to Franklin Street for a beer and southern fare made with locally sourced ingredients at Top of the Hill Brewery, one of the state’s first microbreweries. Named one of National Geographic’s Best Places to Live and Play, “App State,” is a school that bills itself as a special combination of people and place. This is no surprise, since this campus of roughly 19,000 students is located in Carolina’s spectacular Blue Ridge Mountains. You’re only minutes away from amazing views no matter which way you go, and there are more than 50 hiking trails and 20 overlooks in the Grandfather Mountain area. On-campus attractions include the Turchin Center for the Visual Arts, the largest visual arts facility in western North Carolina, eastern Tennessee and southwest Virginia, and the Appalachian Summer Festival, which features music, dance, theatre, visual arts and films open to the public from June through early August. The gorgeous grounds of this university, designed by President Thomas Jefferson in 1819 and designated a UNESCO World Heritage Site, are made for wandering. 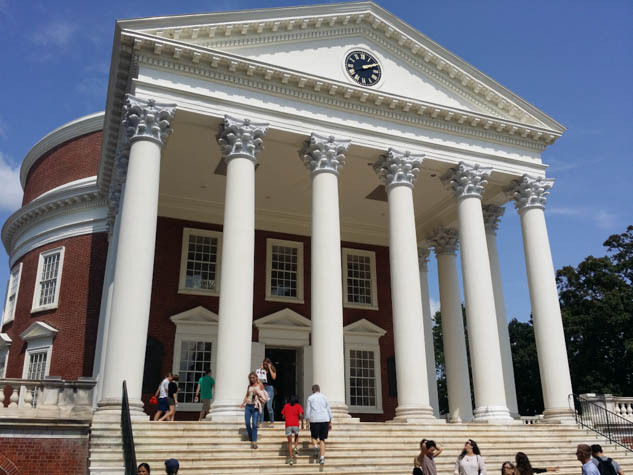 Visit the Rotunda, where you can admire the views of the Lawn or curl up on a couch and enjoy a book written by one of the school’s famous alumni like Tina Fey or David Baldacci. Other famous students include Edgar Allan Poe, and you can stop by his preserved room on The Range to see where the genius got his start. The university also sponsors the Virginia Film Festival every year both on campus and at the Downtown Mall where you can meet up-and-coming artists as well as see premieres from established filmmakers like Spike Lee and William H. Macy. Speaking of film festivals, Columbia hosts two of MovieMaker Magazine’s coolest film festivals in the world, the Citizen Jane Film Festival (at Stephens) and the True/False Film Fest (at Mizzou and locations around town). The walkable 1,262-acre Mizzou campus is designated a botanic garden with more than 42,000 plants and trees, and is also a quick walk to the North Village Arts District with more than 100 artists and studios in downtown Columbia. The downtown area, known as the District, houses more than 100 shops and 70 bars, and hosts roughly 45 live performances every week. You won’t be disappointed if you expect to the see the Nittany Lion on campus; in fact, the big cats are everywhere. At the Palmer Museum of Art, for example, you enter through the lion’s paws, and you have to get the obligatory selfie at the Nittany Lion Shrine, the most photographed site on campus. One of the largest universities in the United States, the campus features the stunning 370-acre Arboretum at Penn State, which, despite being within walking distance of 75,000 people, offers a serene break from all of the school’s activities. Even when the campus isn’t filled with students, there is something going on—I highly recommend attending the Happy Valley Music Fest which happens the first full weekend of June to enjoy local, regional and national acts, as well as the chance to sample foods from different restaurants as part of Taste of Downtown. What’s your favorite college town? Tell us about it on Facebook!